The Summer of Saturn essentially ends this weekend. 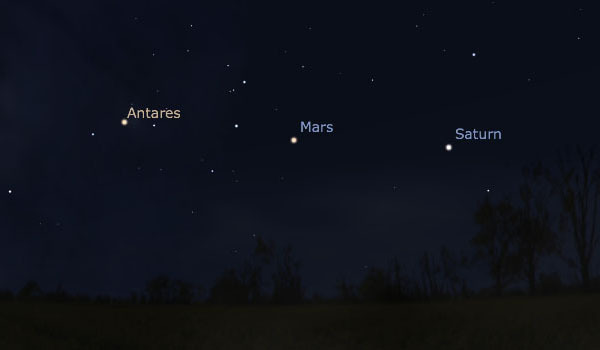 Saturn and Mars are getting lower and lower in the evening sky and will drop below the horizon before the end of September. If the skies are clear this weekend, take advantage of one last chance to see these two planets in the evening sky. Shortly after sunset, as soon as it gets dark, look to the southwest. Close to the horizon, you will see three lights in almost a horizontal line. From left to right, they are the star Antares, the planet Mars, and the planet Saturn. See the Stellarium diagram above. Don’t wait too long, however. Find them at around 8:30 pm, because by 9:00 pm Central time, the three will probably be too low to see over buildings and trees.